Pluto's largest moon Charon has a red spot at its north pole that may be caused by the atmosphere of Pluto, scientists announced on Sept. 14, 2016. This view shows a view looking down on Charon's red spot as seen by NASA's New Horizons spacecraft during its flyby in July 2015. Pluto may be sharing its atmosphere with its largest moon, Charon, creating the visually striking red spot at the satellite's north pole. New research suggests that conditions on the two worlds over the past few billion years would allow Pluto's traveling atmosphere to freeze out on the frigid moon Charon, while radiation would quickly transform the methane and nitrogen ices to a sticky residue known as tholins. "As more and more fragments join up, they build progressively bigger and more carbon-rich, complicated molecules until they are so complex that we don't even try to give them chemical names, just describe them with generic terms like 'organic molecules' or 'tholins,'" Grundy said. "These are what produce the reddish color." The research was published online Sept. 14 in the journal Nature. When New Horizons made its historic flyby of Pluto, it also studied the moons around the dwarf planet. The largest of these moons, Charon, is nearly the size of Pluto itself, leading many scientists to classify the pair as a double-planet system. New Horizons revealed that the massive moon sports a red spot at its northern pole. Based on early measurements taken by the New Horizons spacecraft, Grundy and many othersimmediately speculated that the red spot was made of tholins created by the transfer of Pluto's atmosphere to Charon. They theorized that some of the material could freeze and that, later, radiation could convert it to tholins. Pluto's small size means that it has trouble holding on to much of an atmosphere; many scientists questioned whether much of an atmosphere would remain by the time New Horizons made its visit. Observations revealed that Pluto manages to hold on to much of the gas around it, but some still escapes the dwarf planet's grasp. The red spot on Pluto's moon Charon can be clearly seen in this enhanced color image captured by NASA's New Horizons spacecraft during just before its closest approach to Pluto on July 14, 2015. The reddish area is informally named Mordor Macula. To measure the probability that Pluto's captured atmosphere became Charon's red spot, Grundy and colleagues modeled how temperatures changed over the moon's history. Charon's winters are cold, with polar temperatures only a few degrees higher than absolute zero (minus 459.67 degrees Fahrenheit, or minus 273.15 degrees Celsius) at coldest. Because the winters last so long — well over 100 Earth-years — the imported atmosphere has enough time to freeze. The warmer temperatures near Charon’s equator allows less of the material to fall to the surface, which is why the red spot doesn't extend across the face of the moon. Charon itself is too small to hold on to its own gaseous atmosphere very long, so as the 100-year winters end, the atmosphere evaporates, leaving behind the larger hydrocarbons. "For the most part, Charon's surface is too warm for methane to stick, so the methane molecules that make it to Charon's surface just bounce around there until they either escape back to space again or find a place cold enough to stick," Grundy said. "The winter pole does get cold enough for methane to stick; so methane will accumulate there, but only until the sun rises again in the spring and warms it back up." During Charon's long winters, radiation from the sun and galactic cosmic rays convertedthe atmosphere to heavier material that does not evaporate rapidly when temperatures rise. When the winter pole tilted back toward the sun, ushering in spring, the remaining methane and nitrogen evaporated, leaving behind material that gradually changed to the reddish organics spotted at the surface. 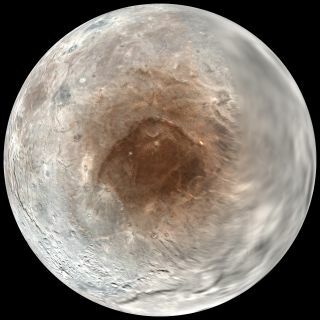 Grundy and his team estimate that about 30 centimeters (12 inches) of tholins would be produced at the poles over Charon's billion-year lifetime. The process should continue in the winter poles today, with material slowly building up its red spot. Although Charon's southern pole was shrouded in darkness during the flyby, the researchers analyzed the light reflecting off of the dayside of Pluto to identify a slow dimming unrelated to the illumination, suggesting that the south pole may also boast its own spot. "We don't have any color data to say that it's red, but in the black-and-white images lit by Pluto shine, it does show a darkening that is similar in darkness and size to what's seen around the northern pole," Grundy said. "The two poles take turns being the winter pole, just like on Earth."